One of the most mysterious creatures in the galaxy is the Great Plains Stalkers which has earned the reputation as being the King of the Corellian Plains. Their speed combined with ferocity make them feared by all those passing through Corellia. Tales have been told of these creatures running alongside even the fastest speeder and dismounting its rider to feast upon. Despite the common perception of these creatures, few have ever encountered them in the wild as they are solitary hunters who reportedly do most of their hunting in the most isolated parts of the Corellian plains. The first indication that they are in the area is a loud roar that sounds almost identical to Razor Cats or Greater Sludge Panthers. Further the hide of this creature is very adaptable to its surroundings and can blend with almost any scenery making them very difficult to spot. This hunter can attest that there have been times where I have practically walked directly in front of one of the deadly Beasts without seeing it. It also contributes to their mythology of being a creature that attacks its prey coming seemingly from out of nowhere. Its ability as a Stalker makes it a truly one of the most dangerous creatures in the galaxy. The speed of this creature is one of its most unique features as they have been seen running stride for stride with speeders. This speed allows them to successfully keep up and kill virtually any creature in the Corellian plains. 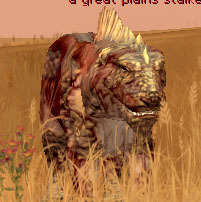 The diet of the Great Plains Stalker includes Krahbu, Spats, Sharnaff, and Gronda. In addition this creature is very territorial attacking anything that crosses its path including Dire Cats, Wrix, Razor Cat, and even other Plains Stalkers. Great Plains Stalkers are solitary hunters and do not tolerate other predators hunting in their territory. 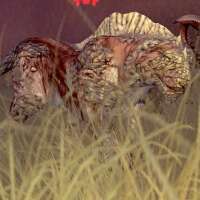 I have seen Great Plains Stalker maul a Grand Wrix with no difficulty. Great Plains Stalkers will even attack other Plains Stalker that they encounter with the attack always resulting in death for one of them. Even the victorious Great Plains Stalker may still die from its wounds during such a conflict as many plains stalkers can be seen in the wild with large scars and bite marks from previous attacks. This is why this creature is so dangerous to humanoid creatures as they view any creature to violate their domain as a trespasser and will attack. Corsec has reported that many missing person cases are believed to be caused by Great Plain Stalker attacks. The result of such attacks is an outrage toward the beasts where hunting teams are hired to go out and hunt down as many as they can find. However most hunters return empty handed from searching for Great Plains Stalkers and the degree of difficulty in tracking and killing has created a mythical essence around the beast. A hunter returning with a Great Plains Stalker is praised very highly and imperials likewise have taken a keen interest in hunting the rare Beast. Another interesting fact about this creature is that despite its ferocity is tamable. The only chance for taming such a beast is to capture one that is very young and bring it back to civilization. The taming of such a creature can only be attempted by the most skilled and talented Creature Handler because when grown the Great Plains Stalker can easily kill the handler with its sharp claws or bone crushing jaws. This pet is particularly prized because of its dedication that has been shown to its master where the Great Plains Stalker will fight to the death if commanded too. Its great speed also makes it ideal for hunting as it can track down and incapacitate most creatures in the galaxy. In my opinion it is the colonists who keep building cities inside what were once Great Plains Stalker hunting grounds that made this an endangered species. One such group is the cult of Lord Nyax who built their fortress right dab in the middle of central Corellia. Human encroachment has decimated there hunting grounds making human contact inevitable. An attempt must be made to preserve sections of the corellian planes so the Great Plains Stalkers can freely hunt and roam. In response to this, creature handlers such as myself have searched the plains in an attempt to tame a baby to preserve this creature from extinction. Since only male Great Plains Stalkers have been identified in the wild and since no one can find an actual lair the search for a baby is extremely difficult. There have been theories that the Great Plains Stalkers do not have female counterparts and reproduce by mating with Crimson Razor Cats. However there could be a cave or an area on some other part of Corellia where a Great Plains Stalker female hunts in her own hunting ground. As to how ferocious the cat is compared to others in the galaxy it has no equal and even the legendary Gurreck from Endor can be easily defeated. Most handlers would never dare duel such a pet in a tournament as they are too valuable to risk. Handlers who have found a Great Plains Stalker will often clone this prized pet to insure if anything does happen another can be made. This pet is often seen in many ceremonial functions such as in parades or in galactic zoos where the Great Plains Stalker can live out its days in peace. Habitat: The Great Plains Stalker hunts and presumably lives in the Riverlands of central Corellia. This creature is very nomadic and is believed to be the primary reason these beasts have no permanent lairs. It is this Creature Handlers belief that when the Stalker is at rest it chooses to stay close to water. From tracking this creature I have found areas next to the riverbank where the damp ground has been dug into by an obviously large creature. I believe that because the plains stalker uses so much energy in moving throughout the Riverlands to cool down. Pack size: The Great Plains Stalkers are solitary hunters and do not hunt in packs like their cat cousins Crimson Razor Cats. Because of their ferocity this creature is prone to violently attack anything that crosses its path. This leads to violent contests between other cats that also hunt in the Riverlands including other Great Plains Stalkers. This has given this beast the distinction of being the king of the Corellian Plains and recognized by all as the most dangerous predator in Corellia. It is believed that all cats created in the Corellian system have descended from the Mire Marauder. The Mire Marauder was once thought to be extinct but recent discoveries have shown this cat to be alive and well but not tamable. Due to biological similarities the Plains Stalkers are structurally similar to the panthers of Talus. The hide similarities are very comparable with just differences in colorization that relates to their planet. Taming Techniques: One of the most difficult creatures to find it is also one of the most difficult creatures to successfully tame and raise. The Plains Stalker�s ferocity is no less potent in its offspring where this handler can attest to their feisty tendencies. The first day I allowed my stalker to venture outside our compound it immediately attacked the first thing that crossed its path. Fortunately was just one of the large butterflies that roam Corellia but was a valuable lesson. With my first Plains Stalker I took the risk of introducing him to my Greater Sludge Panther. This was risky because was unsure of how they would respond to each other and knew that despite the stalkers abilities the sludge panther at this point would have no difficulty killing the young stalker. 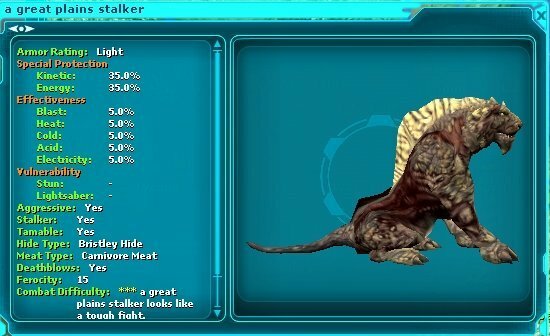 I did this hoping that the Stalker would adapt some of the Greater Sludge Panthers more docile traits and thus become a better hunting pet. At first they stayed away from each other not paying each other much attention to each others presence. I kept them under constant surveillance and did not allow them to leave their enclosed area. Soon however I began to notice the two cats began to become more comfortable with each other and over time were no longer strangers. Soon my Sludge Panther adopted the Stalker and taught it how to hunt and stay alive. My next step was to take both out hunting where through example by the Panther and the gradual acceptance of my commands the Stalker by the time it had become an adult is now one of my most trusted companions. Also the Stalker developed a very strong sense of protectiveness and a pet I know will fight to the death. Then I was fortunate enough to tame a 2nd Great Plains Stalker and once strong enough put under the tender care of my first stalker. At first I was not sure what to expect as Stalkers in the wild are very territorial killing any other that crosses its path. However due to its relationship with my Greater Sludge Panther is became a very attentive parent who protected the baby stalker the same way it would protect me. With these techniques I have successfully tamed and raised 2 Great Plains Stalkers. When taming in the wild it is important to note that the ferocity of this creature is not to be underestimated. Always stay 70 meters away from any potential spawn as they have a tendency to attack anything that crosses its path. With the cats I have noticed the third spawn in both spawn cases produced a baby and have noticed the same cycle with other stalkers such as Swamp Stalkers or Gurrecks. Make sure you not only disarm but I always arm with a weapon u cant use properly so not to cause any unnecessary damage if baby aggros. Store pet and mask scent before starting to close in to tame. Some hunters chose to creep up on their tames but I run to the target because want to waste no time in attempting. If the stalker is to aggro on anything I would rather it be me than anything else and don�t want to take the chance that is would agro on a near by creature. If by chance it does aggro run directly away from creature but keeping it close enough so can easily turn and go back to tame. Upon taming always store directly to datapad to prevent possible newly tamed baby to aggro on any creature nearby.